Mark Bekoff of Psychology Today covers a story reported on by Karen Davis of United Poultry Concerns exposing hatcheries that use baby male chicks as packaging filler in shipments of chicks ordered by their backyard chicken customers. One of these hatcheries is Ideal Poultry Breeding Farms which boasts on its website that it ships close to 5 million chicks a year. According to UPC, Ideal Poultry Breeding Farms is no different from other hatcheries in shipping baby roosters as packing material to buyers of backyard hens and other customers. Here is more information about the shipping of baby chicks and ducklings and how the trend of urban chicken-keeping is an extension of factory farming. 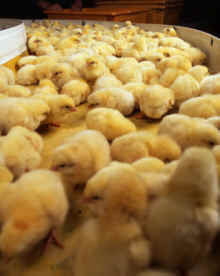 Most chickens purchased are bought from hatcheries or feed stores (feed store chicks originate from hatcheries). Hatcheries ship day-old birds through the postal service without any legal oversight. Young chickens are deprived of food and water for up to 72 hours and exposed to extreme temperatures. As Dr. Jean Cypher, a veterinarian specializing in avian medicine states, “A day-old chick can no more withstand three days in a dark crowded box than can any other newborn.” Other experts in avian medicine and behavior agree that transporting day-old chicks in boxes for the first 24-72 hours of life is cruel and medically detrimental to the birds. Read Dr. Cypher’s complete statement. Using data collected from sanctuaries and rescues that field calls daily about unwanted chickens, we estimate between 20-50% of purchased “hens” are actually roosters. Depending on breed, visually identifying a rooster can take weeks to months. Male chickens are generally unwanted for two reasons: They don’t produce eggs and they are rarely legal in urban or suburban settings. Hatcheries may use rooster chicks as packing material, regardless of whether they were ordered. Most incorporated or urban regions that do permit chickens allow only hens, not roosters. Unwanted roosters may be abandoned to the streets, slaughtered, or end up in a municipal shelter to be killed. Very few find their way into a permanent home or sanctuary.